The growth figures for 2016 have confirmed the picture of a global recovery that is gradually becoming more general. In the euro zone, which up to now had lagged behind, growth has reached 1.7%, driven in particular by strong momentum in Spain, Ireland, the Netherlands and Germany. The air pocket that troubled US growth at the start of the year translated into slower GDP growth in 2016 than in 2015 (1.6% vs. 2.6%), but unemployment has continued to decline, to below the 5% threshold. The developing countries, which in 2015 were hit by the slowdown in the Chinese economy and in world trade, picked up steam, gaining 0.2 point (to 3.9%) in 2016. With GDP growing at nearly 3%, the world economy thus seems resilient, and the economic situation appears less gloomy than was feared 18 months ago – the negative factors have turned out to be less virulent than expected. The Chinese economy’s shift towards a growth model based on domestic demand has led not to its abrupt landing but to a controlled slowdown based on the implementation of public policies to prop up growth. Even though the sustainability of Greece’s debt has still not been resolved, the crisis that erupted in the summer of 2015 did not result in the disruption of the monetary union, and the election of Emmanuel Macron to the presidency of the French Republic has calmed fears that the euro zone would break up. While the question of Brexit is still on the table, the fact remains that until now the shock has not had the catastrophic effect some had forecast. This pattern is expected to continue in 2017 and 2018 as a result of monetary policies that will continue to boost economic activity in the industrialized countries and somewhat scaled down fiscal efforts. US fiscal policy should become even more expansionary, allowing for a rebound in growth, which should once again surpass 2% in 2018. While oil prices have recently risen, they are not expected to soar, which will limit the negative impact on household purchasing power and business margins. The rise should even revive the previously moribund rate of inflation, thereby lowering the deflationary risk that has hovered over the euro zone. Pressure on the European Central Bank to put an end to unconventional measures could mount rather quickly. 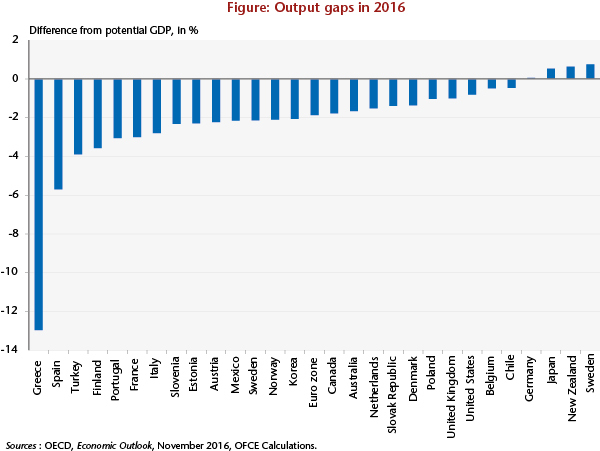 Although the recovery process is consolidating and becoming more widespread, output in most of the developed economies is still lagging behind in 2016, as is illustrated by the gap in output from the potential level, which is still negative (Figure). This situation, which contrasts sharply with the past cyclical behavior of economies as GDP swung back towards its potential, raises questions about the causes for the breakdown in the growth path that has been going on for almost ten years now. One initial element in an explanation could be the weakening of potential GDP. This could be the result of the scale of the crisis, which would have affected the level and / or growth of the supply capacity of the economies due to the destruction of production capacity, the slowdown in the spread of technological progress and the de-skilling of the unemployed. A second factor would be the chronic insufficiency of demand, which would keep the output gap in negative territory in most countries. The difficulty in once again establishing a trajectory for demand that is capable of reducing underemployment is related to the excessive indebtedness of private agents prior to the recession. Faced with swelling liabilities, economic agents have been forced to cut their spending to shed debt and restore their wealth. In a situation like this, unemployment or underemployment should continue to fall, but this will take place more slowly than in previous recovery phrases. Ten years after the start of the Great Recession, the global economy has thus still not resolved the macroeconomic and social imbalances generated by the crisis. The recovery is therefore well under way, but it is still not fast enough.